The two pullouts along Owyhee Lake Road south of the dam are a good place to get wet in Southeast Oregon. While lake diving isn’t amazing and the sometimes stagnant water of Owyhee Lake can have very low viz in summer, there aren’t many options in this part of the world to go SCUBA diving. The submerged canyon walls fall away from the shore quickly which makes for interesting topography to dive. There can be a lot of boat traffic in the summer. Be sure to fly a dive flag. Boaters aren’t used to seeing divers in this lake. Owyhee Lake Road Pull-Outs are a good place to go SCUBA diving in southeast Oregon. Be mindful of boat traffic. Imagery ©20178 Google, Map data ©2018 Google. The pull-outs usually have a decent amount of parking except on popular, busy summer weekends. The dive site unfolds along a couple thousand feet of the southeast canyon wall. There is a particularly interesting cliff along the finger of ridge that heads out from the southern parking area. 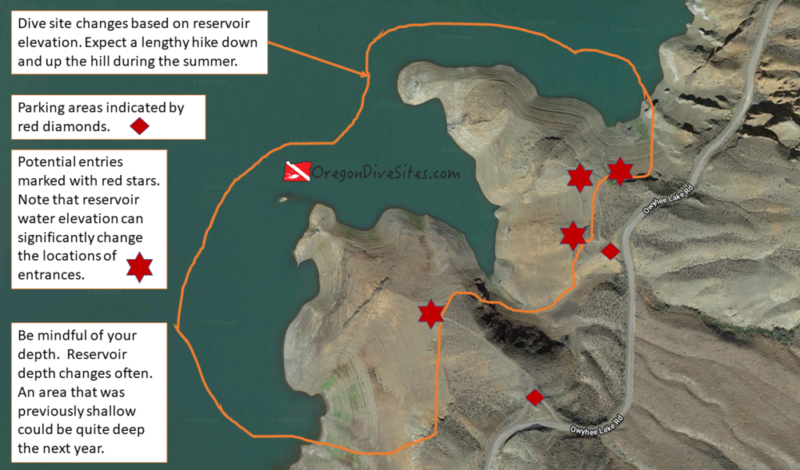 Depending on the height of the water in Lake Owyhee, entrances and exits might be easy or a scramble. It’s a good idea to walk the entrance before attempting it. This is a shore dive although you can dive here with a boat, too. The only waves you’ll see are from passing boats. Be sure to have a good dive float. Depending on the time of year and how much water is flowing into the reservoir, viz could be 30 feet or 3 inches. In the late winter and spring, cold clean water flows into the lake and improves visibility. In the late summer, algae blooms can happen that causes viz to go practically to zero. In the winter and early spring, water temperatures can be in the mid 30s while in the late summer, water temperature can be 60 Fahrenheit. Spring is a good time to go diving here for better viz and for a fuller lake. You won’t go past about 110 feet here. This is an altitude dive site. We rate this as an intermediate dive because of the potential for a long entrance hike and for the need of altitude training. If the reservoir is full, a SCUBA diver might only need to walk 100 feet. Otherwise, it might be a 1000 foot hike down the canyon wall. There are several state park campgrounds in this area of Owyhee Lake.